After a meteor shower bursts from the heavens, raining destruction on the unsuspecting citizens of Smallville, years pass, and the healing process leaves the town's inabitants with scars and secrets. From the ashes of tragedy, a popular yet awkward teen attempts to decipher the meaning of his life and his clouded past. As he struggles with the transition from boyhood to adulthood, Clark finds that his strength and strange abilities set .. 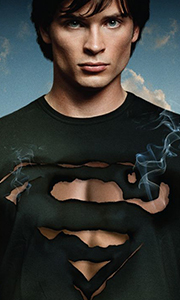 Between the boy Clark Kent thought he was and the man he is destined to become lie the compelling stories of Smallville, the popular action series that re-imagines the Superman saga from its roots. All 21 Season One episodes are in this collector's set powered with spellbinding Extra Feaures. Watch. Wonder. Enjoy. A legend grows up in Smallville. Special Features Pilot Commentary By Executive Producers Alfred Gough & Miles Millar And D.. The series that redefines the origins of the world's greatest hero reaches its powerful conclusion with more revelations, more fascinating characters from DC Comics lore, and a mind-blowing, spirit-lifting finale that is everything fans could want. In this 22-Episode Season 10, super heroes emerge from the shadows, only to be driven underground by a public that labels them vigilantes. At the same time, otherworld forces of darkness gath..